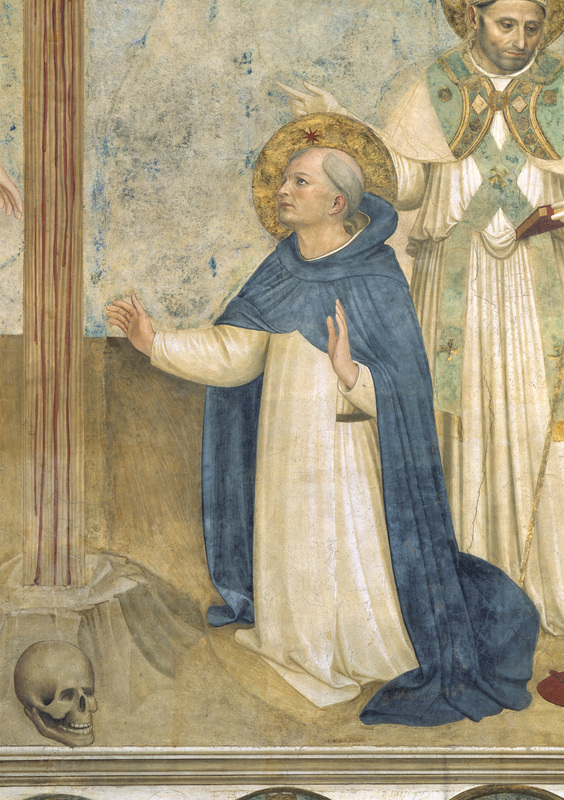 Known in the Dominicans as Brother John from Fiesole (c. 1395-February 18, 1455), we know him best as Fra Angelico. When singing my praise, don’t liken my talents to those of Apelles. Say, rather, that, in the name of Christ, I gave all I had to the poor. The deeds that count on Earth are not the ones that count in Heaven. I, Giovanni, am the flower of Tuscany. When in Rome, I pay a visit to the grave of Fra Angelico to pray for the Catholic artists. May Blessed Jordan of Saxony pray for the Order of Preachers today and always, and grant an increase of vocations to the Dominican Family. 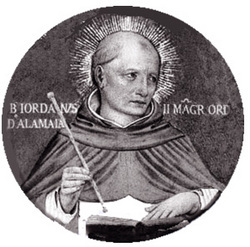 May he stir up the hearts of young men and women, as once he did on this earth, with a fervour for Truth, to give themselves in its service in the Order of Preachers. May he clothe us, his brothers and sisters, with his zeal and passion for Christ the Word, and may he give us cause joyfully to laugh in his company for ever. Amen. The Lord led the just in the right paths. And showed him the kingdom of God. O God, Who does enlighten Thy Church by the wonderful learning of blessed Thomas, Thy Confessor, and makes it fruitful by his holy works; we beseech Thee, grant us both to understand what he taught and to follow his example in what he practiced. It is evident that not all are able to labor at learning and for that reason Christ has given a short law. Everyone can know this law and no one may be excused from observing it because of ignorance. This is the law of divine love. As scripture says, The Lord will quickly execute sentence upon the earth. This law should be the standard for all human actions. In the case of products of human manufacture, each product is considered right and good when it conforms to a standard. So also each human act is considered right and virtuous when it conforms to the standard of divine love. But when a human act does not conform to the standard of love, then it is not right, nor good, nor perfect. This law of divine love accomplishes in a person four things that are much to be desired. First, it is the cause of one’s spiritual life. For it is evident that by the very nature of the action what is loved is in the one who loves. Therefore whoever loves God possesses God in himself; for scripture says, Whoever remains in love remains in God and God in him. It is the nature of love to transform the lover into the object loved. And so if we love God, we ourselves become divinized; for again, Whoever is joined to God becomes one spirit with him. Augustine adds, “As the soul is the life of the body, so God is the life of the soul.” Thus the soul acts virtuously and perfectly when she acts through charity, and through charity God lives in her; indeed, without charity she cannot act; for scripture says, Whoever does not love, remains in death. If a person possesses all the gifts of the Holy Spirit, but lacks charity, that person has no life. For it matters not whether one has the grace of tongues, or the gift of faith, or any other gift such as prophecy; these do not bring life without charity. Even if a dead body should be adorned with gold and precious jewels, it nevertheless remains dead. The second point about charity is that it leads to the observance of the divine commandments. Gregory the Great says that charity is not idle. For charity is present if one is occupied about great things; but if one is not so occupied, charity is not present. We see a lover do great and difficult things because of the one loved, and that is why the Lord says, Whoever loves me will keep my word. Whoever keeps this command and the law of divine love fulfills the whole law. A third point about charity is that it provides protection against adversity. For misfortune cannot harm one who has charity; rather it becomes useful to that person; as scripture says, All things work for good for those who love God. Furthermore, misfortune and difficulties seem pleasant to the lover, and our own experience verifies this. A fourth point about charity is that it truly leads to happiness, since eternal blessedness is promised only to those who have charity. For all other things are insufficient without charity. You must note that it is only the different degrees of charity, and not those of any other virtues, which constitute the different degrees of blessedness. Many of the saints were more abstemious than the apostles, but the apostles excel all the other saints in blessedness because of their higher degree of charity. From a conference by “St. Thomas Aquinas” (Opuscula, In duo praecenta… Ed. J.P. Torrel, in Revue des Sc. Phil. Et Théol., 69, 1985, pp. 26-29.